When I was growing up, I never heard that we gave gifts to our loved ones at Christmas in remembrance of God’s ultimate gift to us of Jesus. We baked cookies, listened to Christmas music and talked all about what Santa would bring us. But I can’t say that keeping Christ in Christmas was the major focus of our holiday until I was older. It wasn’t that He wasn’t part of it; it’s just that as a kid I needed help connecting the dots between celebrating Jesus’ birth and our crazy December schedule of activities. No matter how you celebrate, it’s a given that there is not quite enough month to get everything in, unless we intentionally limit the things we do and how we do them. Our kids won’t understand about the true meaning of Christmas any better than I did, unless we take time to have conversations and instill traditions that point to Jesus.To help, here are simple ideas for keeping Christ in Christmas, fun and easy Christmas activities for kids, links for listening to free online Christmas music and some great recipe ideas for your Celebration of Jesus’ Birthday! Praying you have a blessed and Merry Christmas as you focus on JESUS! 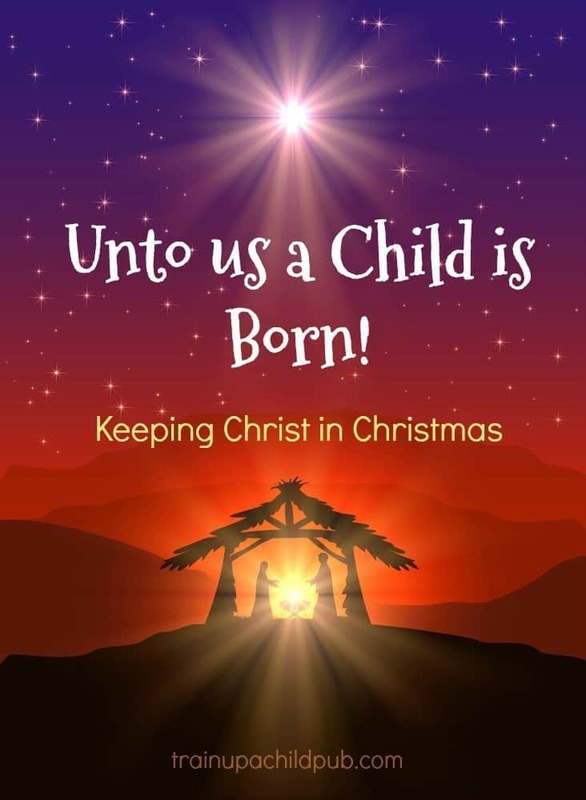 Keeping Christ in Christmas – and what about Santa? The best way to keep Christ in Christmas is to keep Him in the forefront of your family’s lives every day of the year. To do that, make sure to study the Bible with your kids and frequently talk about how to “live” what it says. Also, choose to be part of a Christ-honoring, biblical church family. Talk to your kids about Biblical truths and memorize Scripture together. Once your kids are old enough, regularly talk about the Cross, and what that means to us as believers. How we are reconciled to God forevermore because of Christ’s substitutionary death on our behalf. If you have very young children, you might be wondering about what you should tell your kids about Santa. Many Christians feel as though there is no problem with Santa. But you might find yourself not feeling quite comfortable telling your kids there is someone they can’t see who all-knowingly “sees them when they’re sleeping” and “knows when they are naughty or nice.” (The difference between Santa and Jesus might be a little confusing to young children, mightn’t it?) If you are experiencing that niggling doubt, it could be that the Holy Spirit is telling you to do something different in your family. Without judging anyone else for “doing Santa,” we opted not to tell kids there was a ‘real live’ Santa who brought them presents. (We don’t ‘do’ the Easter bunny or Tooth Fairy, either.) We haven’t been sorry about that decision, even though there were some fireworks in our family about it when our children were small. If you are wondering how to deal with that issue, here is a post from an author/friend who had a ‘gentler’ way to deal with the issue. If you send out Christmas cards, have them be Christ-centered, rather than generic holiday cards. If you make them, stamp a simple graphic on them with a Bible verse included. Here are some Bible verses that we commonly see at Christmastime. Keep Christ the central focus of your holiday activities. This thoughtful article helps keep your preschoolers from being overwhelmed with it all. Consider a family service project during Christmas time, such as shoveling your elderly neighbor’s lawn, serving as a family in your local shelter’s kitchen, or singing Christmas carols at a nursing home. Set up a nativity scene — hopefully of an unbreakable material — and let your kids play with it, retelling and dramatizing the Christmas story. This is the one we have, given to us by my thoughtful mother-in-law a few pieces at a time. We have loved it because it is made of some kind of resin that survived lots of dramatizations. In fact, with our children now in their mid and late 20s, it is still is one of our kids’ favorite things to unpack and set up for Christmas. Above all, keep decorations, dinners schedules and gifts simple so there is time to relax together, serve others and focus on the true meaning of Christmas! Talk about how God gave us the first Gift — the gift of His only Son — and how that gift can be multiplied as we give that gift to others by telling them about Him. Then play this Christmas word game. Give your kids each a country to research and report back how they each celebrate Christmas. Here is a more active game helping kids understand the wise men and their gifts – Star Light, Shining Bright. Try this adorable clothespin nativity set! These are some really cute stocking stuffers that your kids can make for each other and other families. Hit the jackpot with this compilation of children’s Bible games on Pinterest! Here’s another Pinterest collection of Christmas crafts for kids! Don’t you just love Christmas music? Here’s a website you can download music, including Christmas tunes. Surround your household with uplifting Christmas hymns. Listen to the classics at this website. Other Christmas music (not free) is found at Amazon.com — and did you know (or am I the last one to learn this?!) that if you buy any music, even if it is a CD for someone else, you can immediately download it and play it yourself on your computer? I didn’t know! Here are seven of our favorite children’s Christmas books. Actually, they are for adults and children, as all the best books are. Read this free Kindle edition of The Gift of the Magi with your kids and talk about the simplicity of the gifts in the story — after all, it’s JESUS’ birthday that we are celebrating, not ours. This sweet, beautifully illustrated children’s book shares the Christian symbolism in the Christmas song The Twelve Days of Christmas. Making a birthday cake for Jesus ‘brings it home’ for little ones. Here’s a recipe. Here are luscious Christmas foods from around the world – with pictures and recipes! It just wouldn’t be Christmas without the scent of gingerbread! Take a look at this article to see the long history of gingerbread. Since some of us prefer gingerbread cookies to sugar cookies this year we decided to make our Christmas cookies out of gingerbread this year. Having people over for the holidays? Here are 21 luscious-looking and healthy appetizers for your table! How about at your house? Were you raised mostly focused on the secular aspects of the holiday by default, or did your parents mindfully connect your activities to Whom we are celebrating? Is your family’s Christmas season about the same, or have you done things differently as you are raising your kids?